As one might expect from the amazing diversity of colors and patterns exhibited by more than 10,000 bird species found in the world, birds can see color. The colors in the feathers of a bird are formed in two different ways, from either pigments or from light refraction caused by the structure of the feather. In some cases feather colors are the result of a combination of pigment and structural colors. The greens of some parrots are the result of yellow pigments overlying the blue-reflecting characteristic of the feathers. Pigments are colored substances that can be found in both plants and animals. The coloration created by pigments is independent of the structure of the feather. Pigment colorization in birds comes from three different groups: carotenoids, melanins, and porphyrines. 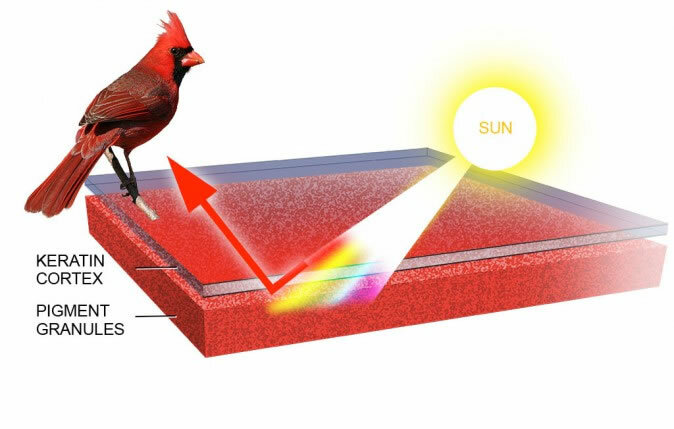 The red of the Northern Cardinal comes from a class of pigments called carotenoids. Carotenoids are produced by plants, and are acquired by eating plants or by eating something that has eaten a plant. Carotenoids are responsible for the bright yellows seen in goldfinches and Yellow Warblers as well as the brilliant orangish yellow of the male Blackburnian Warbler. Carotenoids can interact with melanins to produce colors like the olive-green of the female Scarlet Tanager. Melanins occur as tiny granules of color in both the skin and feathers of birds. Depending on their concentration and location, melanins can produce colors ranging from the darkest black to reddish browns and pale yellows. Melanin provides more than just coloration. Feathers that contain melanin are stronger and more resistant to wear than feathers without melanin. Feathers without any pigmentation are the weakest of all. Many otherwise all white birds have black feathers on their wings or black wingtips. These flight feathers are the ones most subject to wear and tear. The melanin causing the tips to appear black also provides extra strength. Porphyrins, the third pigment group, are produced by modifying amino acids. Although the exact chemical structure of each porphyrin differs, they all share a common trait. They fluoresce a bright red when exposed to ultraviolet light, much the way certain rocks and minerals are known to do. Porphyrins produce a range of colors, including pink, browns, reds, and greens. Porphyrins are found in some owls, pigeons and gallinaceous species. 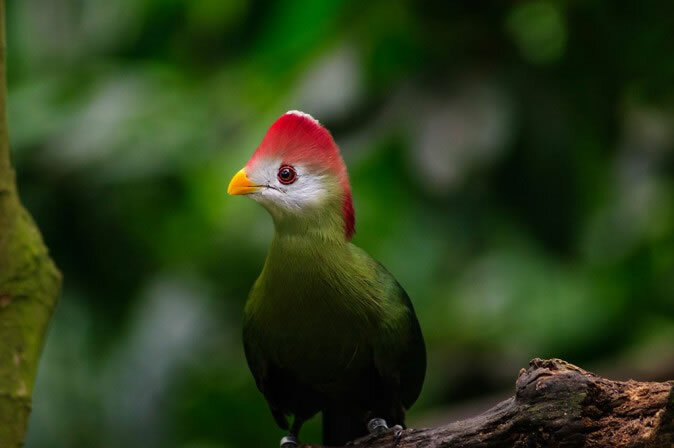 They can also produce the brilliant greens and reds of turacos. When pigments are present (or absent) at unusual levels the appearance of a bird can change dramatically. Color abnormalities, while not common, do occur on a regular basis. Bird species that commonly show aberrant white patches include Canada Goose, American Crow, Black-capped Chickadee, Dark-eyed Junco, Common Grackle, and House Sparrow. Adding to the diversity of avian colors are colors produced by the structure of the feather. 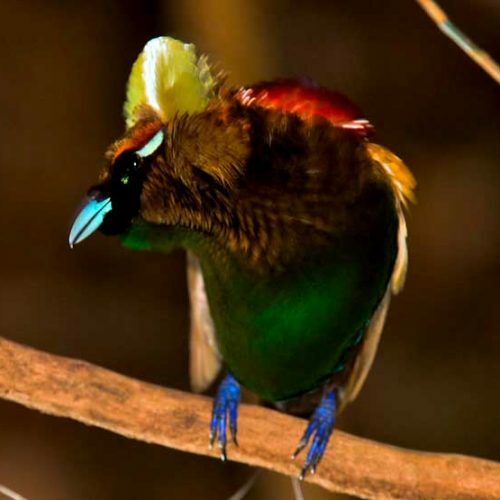 Instead of pigments, these colors are produced as light is refracted by the proteins in the feather. The best known example is the gorget (throat feathers) of many hummingbird species. 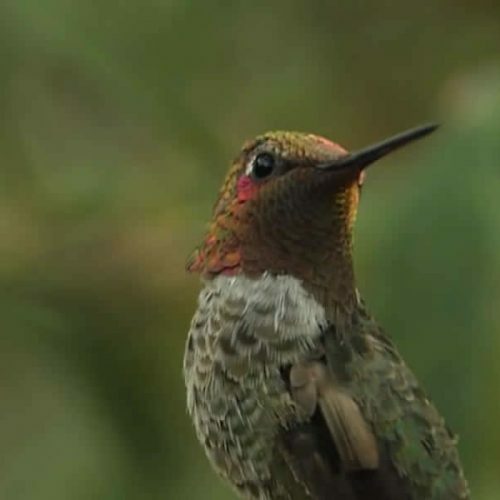 The iridescent colors of the gorget are the result of the refraction of incident light caused by the microscopic structure of the feather barbules. The refraction works like a prism, splitting the light into rich, component colors. As the viewing angle changes, the refracted light becomes visible in a glowing, shimmering iridescent display. Many species of birds have feathers that exhibit iridescent colors, including the Purple Gallinule and Tricolored Heron. Not all structural colors are iridescent. Tiny air pockets in the barbs of feathers can scatter incoming light, resulting in a specific, non-iridescent color. Blue colors in feathers are almost always produced in this manner. Examples include the blue feathers of bluebirds, Indigo Buntings, Blue Jays and Steller’s Jays. The blues seen in the feathers of Indigo Buntings, Mountain Bluebirds, and Steller’s Jays are structural colors. If you find the feather of a Blue Jay or Steller’s Jay you can see for yourself how this works. First, observe the feather in normal lighting conditions and you will see the expected blue color. Next, try back-lighting the feather. When light is transmitted through the feather it will look brown. 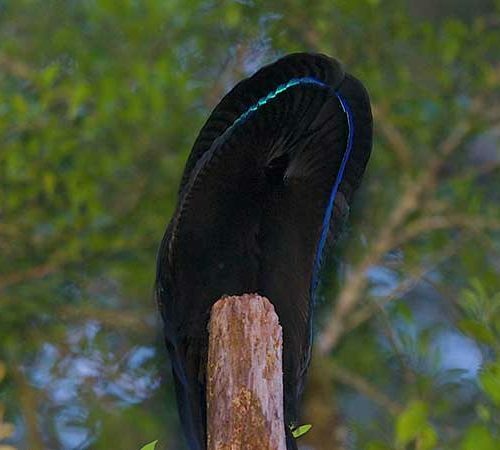 The blues are lost because the light is no longer being reflected back and the brown shows up because of the melanin in the feathers. The feather structures of many species also reflect light in the ultraviolet range. Because many birds can discriminate a greater variety of colors than humans, including ultraviolet wavelengths, they can appear quite different to each other than they do to us.